I’ve been enjoying the interviews of the Furled Sails podcast and especially enjoyed the two part interview with Paul Lutus. It prompted me to download and read his free book about his circumnavigation which is also a great read, I’m amazed it was never published. In any case, if you’re looking for a way to get more sailing content during your morning commute you can’t do any better than checking out the Furled Sails sailing podcast! Preparing a boat for cruising is a lot of work and keeping track of the list gets overwhelming. 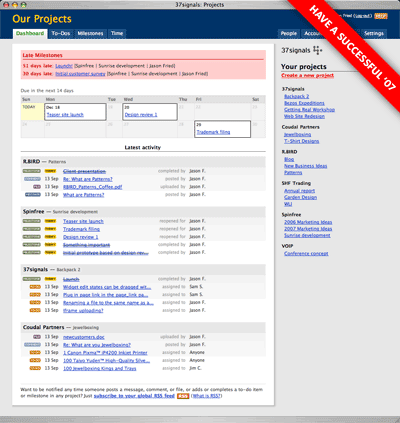 We’ve been using 37 Signal’s web based project management solution Basecamp and have been extremely happy with it. It has TODO lists where you can assign the work to various people, writeboards for documenting things like part numbers, and messages for discussion. The free plan has proven more than enough for our needs! You are currently browsing the Susan, Sequoia, and Todd go sailing blog archives for January, 2007.